What Is Drop Shipping? How Does Dropshipping Work? What is drop shipping and is it worth my time? Is drop shipping for me? How do I make money with drop shipping? What things do I need to start drop shipping? How do I find products to drop ship? Where can I sell drop shipped products? Can I drop ship internationally? What are the risks involved in drop shipping? What are some good strategies or tips to running a successful drop shipping business? Large Product Catalog: A larger selection of products gives you better chances of finding the most profitable ones. Navigable Directory: Find a drop shipping website that makes finding products for your store easy. Look for companies that provide filters to narrow down your searches. Credible Suppliers: Work with a drop shipping company that properly screens suppliers so that you know you’re only working with reputable ones. Easy Order Fulfillment: A drop shipping company that lets you easily place orders with suppliers saves you plenty of work. International Shipping: Ideally, you’ll want to work with a drop shipping company that lets you cater to customers from anywhere in the world. Efficient Shipment Tracking: Choose a drop shipping service that readily provides tracking codes or even better, offers built-in product tracking for all your orders. Streamlined Product Uploads: Being able to easily publish your products to any of your stores is a feature you should look for in any drop shipping company. In-Depth Instructional Material: You’ll want a drop shipping company that guides you through the basics and properly trains you how to make the most out of their service. Relevant Market Metrics: Find a drop shipping company that updates you with real market data so that you can make better business decisions. Top-Tier Customer Support: You need to be able to easily get in touch with customer representatives so that problems can be dealt with swiftly. We took a look at the above criteria in finding the best drop shipping company for you to partner with. The more of these features that a service provides, the better they generally rated. Additionally, the levels of quality, efficacy, and reliability at which they offer these services were also taken into account. Find out how each service performs with our in-depth drop shipping reviews. We’ll be ranking them from best to worst, with a maximum rating of 5 out of 5 stars. Heard of drop shipping? It’s gotten more and more popular over the last few years. A lot of regular individuals have used the model to make thousands of dollars online. In this section, we’ll go over the basics of drop shipping and how aspiring ecommerce entrepreneurs can build a profitable business. We’ll provide answers to some of the most common questions you might have. So to kick things off, know that drop shipping is a perfectly legal and legitimate way of making money on the internet. It’s a business model that anyone can adopt and get into. And thankfully, there’s still plenty of opportunity to carve out your very own niche in the market. However, it’s by no means a simple solution to instant profitability. Like any other business, it does have its share of drawbacks as well. Take a look at some of the good and not-so-good things about drop shipping below. Low Startup Cost: With no starting inventory needed, capital requirements are much smaller than traditional retailers’. It’s very easy to enter the market and start drop shipping today. You only need a computer and reliable internet access. Millions of Products to Choose From: As a drop shipper, you have the opportunity to choose from a truly vast selection of products. The internet is full of suppliers itching to sell their products , you just have to be careful in finding the right ones. Inherently Scalable: As your business grows, adding more and more products is easy and doesn’t cost much, if any. Use this to your advantage and continue to expand your product lines without having to stock up on inventory. Can Work from Anywhere: You can manage and operate a drop shipping business on-the-go. If the digital nomad lifestyle appeals to you, drop shipping is an opportunity to live it. Low Margins: With plenty of competition who offer similar (if not the same) products, you’re limited in how much you can mark up your items. You have to rely on creative solutions to add value to your brand, to justify higher price tags. Shipping Costs Can Pile Up: This is true if you drop ship from multiple suppliers. If a customer buys products that ship from different sources, not only will shipping times vary, but you’ll have to shoulder the cost for each supplier. Difficulty in Tracking and Fulfilling Orders: The nature of drop shipping means you don’t have 100% control over the shipping procedures of your products. There are ways to this address this, but errors can and will happen quite often. Poor Quality Control: Products don’t originate from you, so you won’t be able to inspect every item that ships to your customers. Make sure to partner with credible suppliers or go the extra mile and try out the products yourself. The basic idea behind it is really simple. As a drop shipper, you act as a middleman between suppliers and customers. You generate profit by marking up the wholesale price of a third party’s goods; and then selling those goods to customers at a retail price you decide. Customer buys a product from your store. You earn the retail price you set. You contact the supplier and place the customer’s order and have the product delivered directly to the customer. You pay them the wholesale price they set. In drop shipping, you don’t have to stock any of the items you sell. Production and inventory are all handled by the supplier – translating to lower startup costs compared to traditional retailers. You only need an online store to showcase your products and generate sales. Now you might ask: Why would a customer choose to buy from your store, when they can buy it from the supplier at a lower price? Well, the answer to that represents the actual challenge in drop shipping. Ultimately it comes down to value. Running a successful drop shipping business means most of your time will be spent defining those values and successfully communicating them to your customers. Is it worth all that effort? Well yes, it can be. Drop shipping can prove to be a profitable and gratifying venture if you do the work required to stay on top of your game. It’s definitely not a novel concept and competition will be tough, but if you do what it takes to succeed, there’s plenty of opportunity in the market to make all your hard work pay off. That depends. Drop shipping isn’t for everybody. If you’re considering putting up a drop shipping business for the first time, you’d best prepare yourself for plenty of hardship. While there are tools available that streamline the process, it takes a certain kind of readiness and flexibility to face all the challenges that come with drop shipping. It’s a real business with correspondingly real problems – and there will be many. You can expect to be working long and odd hours – especially in the beginning while you’re still getting the hang of things. It also helps to have a strong grasp of branding and marketing to run a profitable drop shipping business. You have to understand what customers want and deliver accordingly. To be successful at drop shipping, you have to be prepared to commit for the long haul, and have the discipline to push yourself daily. Just like any other business, it takes grit and the right set of skills to reap lasting rewards. Basically, you make money with drop shipping by selling products! Each sale earns you revenue because you’re paying for it at wholesale price, while selling it a higher retail price. You pocket the difference and end up with a profit. Well, at least that’s the idea. You have to consider that most suppliers will also charge you additional fees on top of their advertised price. Also take into account the money you invest to generate sales, so make sure to price your products accordingly to cover your expenses. 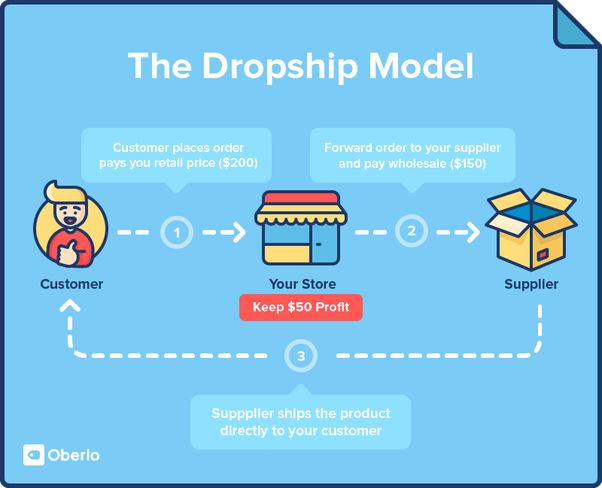 It takes a balance between proper pricing, successful marketing efforts, and value creation to be profitable with drop shipping. Take the time to get this right – try things out and stick with what works, and you’ll be on your way to consistent earnings. Products to Sell: Next, you’ll obviously need products to sell. You’ll want to look around the market for the right products and take the time to verify the credibility and quality of all your suppliers. You can do all this on your own, but it will require a significant amount of time and research. It also helps to have a specific niche in mind, so you can home in on your market and set yourself apart. You might want to partner with a drop shipping service to make this side of the job go much more smoothly. Storefront or Marketplace Presence: You’ll need to create some kind of storefront to display all your products. This serves as your retail space where you’ll be interacting with your customers. There’s plenty of available platforms out there, so choose the ones appropriate for your brand. Valid Business Documents: And finally, some drop shipping companies or suppliers will ask you to prove the legitimacy of your business before allowing you to resell products. Copies of your business license and tax information may be required. And that’s it! That’s pretty much everything you need to start drop shipping. Of course, there are other important things you might want to invest in, especially as you grow your business, but for now we’ve covered the essentials. Scour the market for reputable suppliers whose products you can resell. Whether by searching online or visiting trade shows, you’ll have to do all the work and build relationships on your own. This method can be very time-consuming. It can also be difficult to manage once you start working with multiple suppliers. Sign up for a drop shipping service that aggregates a list of many suppliers you can choose from. Simply choose products from their product catalog and quickly fill up your virtual shelves. You’ll be able to see all the suppliers you do business with in one place. Generally speaking, you can sell drop shipped products on any eCommerce platform or marketplace you’d like. Some drop shipping services will only work on specific platforms, but for the most part, you’re free to sell anywhere. You have to upload products to chosen platform – including images and descriptions. And while you can do this manually, working with a drop shipping company that automates this process is a huge advantage. Look for services that provide easily-uploadable product data files (usually in CSV format) or even one-click publishing for your store. Yes! You can set up and run your drop shipping business from anywhere in the world. Your business, your suppliers, and your customers can all be based in different countries. For example, you can source products from China and have them directly sent to customers in the UK. However, not all drop shipping services offer international shipping. Some services only drop ship to within the US or Canada – which means your potential customer base will be much smaller. It’s a good idea to work with drop ship companies that don’t have these restrictions. Low startup costs represent low risk. In drop shipping, you don’t stock your products so you don’t have to worry about expensive upfront costs or unsold inventory. But as a side-effect, you can’t guarantee order fulfillment and product quality as well as traditional retailers can. This actually represents the biggest risk to your business. This problem is highlighted when dealing with returns and refunds. Slow processing of orders or items not living up to your customers’ expectations can be common occurrences. If you aren’t able to deal with them quickly, you’ll be putting yourself at great risk. Being unable to satisfy your customers puts your reputation on the line. And in drop shipping, that’s really all you got going for you. The good news, however, is that these risks can be significantly minimized by partnering with the right drop shipping company. They’ll help you avoid these mistakes and provide you tools to let your business thrive. Partnering with a drop shipping service takes a lot of the hassle out of operating your business, but we recommend to take it a step further to maximize your efforts. We’ve compiled some helpful tips from successful drop shippers that you can adopt into your own business. These are good practices that address the biggest dangers to your success. Focus on high-value items. Typically, you’d want to put most of your effort on items in the hundred-dollar and above ranges. Not only does this net you bigger profits, it also represents fewer problems to deal with. Since each customer complaint is important – regardless of the price of their purchase – you will have to address them all individually. And it’s simply more efficient to have to deal with a few high-value orders than many small-value ones. When dealing with refunds or returns, have it shipped back to you. It’s difficult to keep track of returned items with suppliers, and a lot of them don’t even accept returned goods. Since it’s your responsibility to resolve issues like this, it’s sometimes a better idea to just have it returned to you. If the product is still unused and in good working order, you could ship it to the next customer. If not, you’ll probably have to take the loss. But at least you can use the opportunity to take a look at the product and review it yourself. Invest in the products yourself. Before putting an item on your store, take the time to test it out. You’ll be able to create content unique to your brand. Whether as high-quality photos or real-life reviews, producing engaging content that build authority and trust with your customers is key to establishing a foothold in the already saturated market. Make customer support a priority. Most of your problems in drop shipping will come in the form of customer complaints. You have no control over shipping times and item stocks, but ultimately it’s your job to communicate with the customer and fix their problem. It may be very costly, but it’s the price you have to pay for maintaining a good image. Be transparent with shipping times. Drop shipped items usually take a lot longer to be delivered to your customer. It’s the nature of the business and can’t really be avoided. But as long as you indicate this clearly on your store, most customers won’t mind or take it against you. Take a drop shipping class (or two). It doesn’t hurt to brush up on your business acumen by enrolling in a drop shipping class. You can learn from the experts and read about people just like you who’ve made a success from adopting this business model. There’s plenty of free and premium courses available online and most of them offer great insight that you won’t find anywhere else. And there you have it! That was a lot of information but hopefully we’ve left you with a stronger understanding of how drop shipping works. If you decide to pursue a career down this path, know that it can be very rewarding as long as you persevere and are smart about it. Be prepared for your fair share of problems, adopt some of our suggested strategies, partner with the right drop shipping company – and you could potentially be the next success story other aspiring entrepreneurs read about.